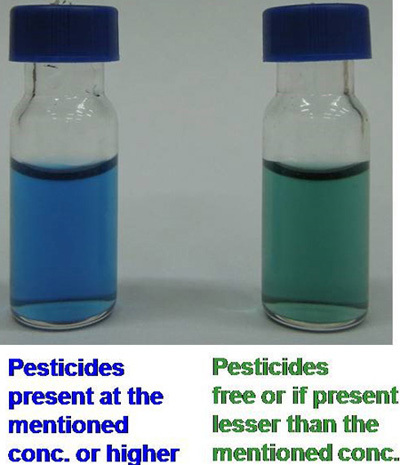 Organophosphate (OP) and organocarbamate (OC) pesticides are most commonly used pesticides for agriculture and domestic use. Presence of these insecticides is thus expected in the soil samples, water resources and in food commodities (vegetables, fruits and spices). A simple visual detection method for presence of these pesticides in food samples will be useful for farmers, traders and consumers. BARC has developed a colorimetric visual biosensor kit (BioKit) for detection of safe levels of OP (Methyl parathion, Parathion, Monocrotophos, Chlorpyrifos, Phorate, Profenfos, Quinalphos and Dichlorvos) and OC (Aldicarb, Carbaryl, Carbofuran, Carbosulfan) pesticides. Simple, visual detection kit for detection of pesticide residues. The chemicals are safe to handle and results can be seen within 60 minutes. Manufacture of kits can be easily absorbed by entrepreneurs. For detection of pesticide residues in farm produce. For use in food industry to detect contamination of products delivered prior to export. For Domestic use after purchase of organic fruits and vegetables. Organophosphate (OP) and organocarbamate (OC) pesticides are most commonly used insecticides for agriculture and domestic use. Presence of these insecticides is thus expected in the soil samples, water resources and in food commodities (vegetables, fruits and spices). A simple visual detection method for presence of these pesticides in food samples will be useful for farmers, traders and consumers. 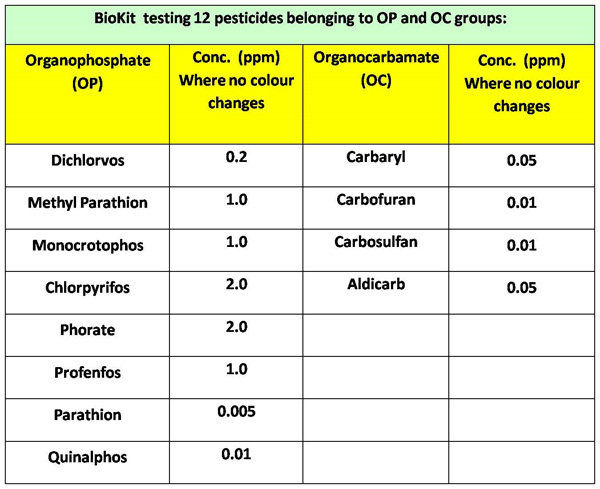 BARC has developed a colorimetric visual biosensor kit (BioKit) for detection of safe levels of the following OP and OC pesticides. Standard Chemistry laboratory capability required. Equipment such as lyophilizer, refrigerator with freezer, biochemicals and glassware. Helping hand for processing and packing, etc. Interested parties with Engineering & Scientific knowledge, good financial background and adequate experience of products manufacturing & fabrication with technical capability in the area of interested technology and having or interested in setting –up facilities for production would be preferred. Trombay, Mumbai – 400 085, India. Note:Applications without processing fee as applicable above of Rs. 500/- or US $50/- for each technology will not be considered.